These socks took forever to complete. The knitting itself wasn't that long considering I kept them as my purse knitting for the most part, but the whole process, from start to finish took well over a year. I wound the yarn into a ball intending to knit a simple pair of socks, had several false starts when I couldn't decide on the right yarn/pattern combo and then finally a year later picked them up again and committed myself to finishing them! The yarn is Viola Sock in a very pretty purple/blue colourway (delphinium I think?). 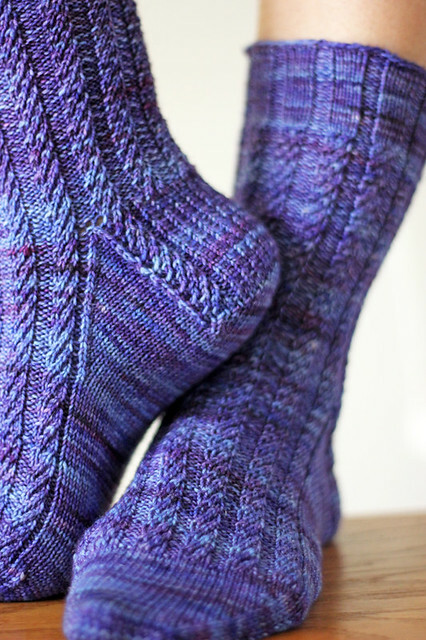 The Nine to Five Sock pattern by Nicole Hindes is super popular with well over 1000 projects on Ravelry, and for good reason, these socks are lovely! I'm still not convinced that this was the best yarn/pattern combo though, the yarn is a bit too variegated to really highlight all those twisted stitches to their fullest potential, but overall, these socks still rock. They are comfortable and very pretty, I really love the detail down the side of the heel flap, that's the cherry on top for me. Is there really any better feeling then finishing a languishing WIP? I think not.